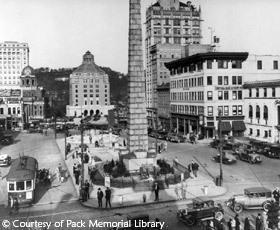 Asheville in the 1920’s was an exciting place! Celebrities, including F. Scott Fitzgerald and Edwin Grove flocked to our beautiful city, joining locals like Thomas Wolfe, finding inspiration in the gorgeous mountain setting. Sadly, on November 20, 1930 the Central Bank and Trust Company folded and Asheville joined the rest of the country in the Great Depression. Adversity breeds innovation; however, and in 1938 young Doctor William McGuffin recognized the need for quality medical care for young families and children. The practice that would become Asheville Pediatrics was born. While physicians have cared for children as long as there have been physicians and children, the development of specialized training for pediatricians was not realized until the early middle of the twentieth century. The American Academy of Pediatrics was formed on June 23, 1930, The American Board of Pediatrics in 1933, and the first issue of the Journal of Pediatrics was published in 1948. By the late 1950’s and early 1960’s, the number of pediatricians in the United States was growing rapidly. Asheville was no exception to this trend and by 1970 Dr. Richard Rogers joined Dr. Thomas Readling and Dr. McGuffin, and Asheville Pediatric Associates was established as the first Pediatric Practice in the area. As the decades have passed, Asheville Pediatrics has grown and changed along with the rest of Western North Carolina. Our founding fathers have retired and new faces have joined our family. Our patients have grown up and now we see their children and grandchildren. Yet, the more things change, the more they stay the same; at Asheville Pediatrics we continue in our unwavering commitment to providing cutting-edge pediatric care in a compassionate and child-friendly environment. It is our privilege and our delight to work with you and your children!